On the left, the TI 59 with its card reader, on the right the TI 58C with a module software. 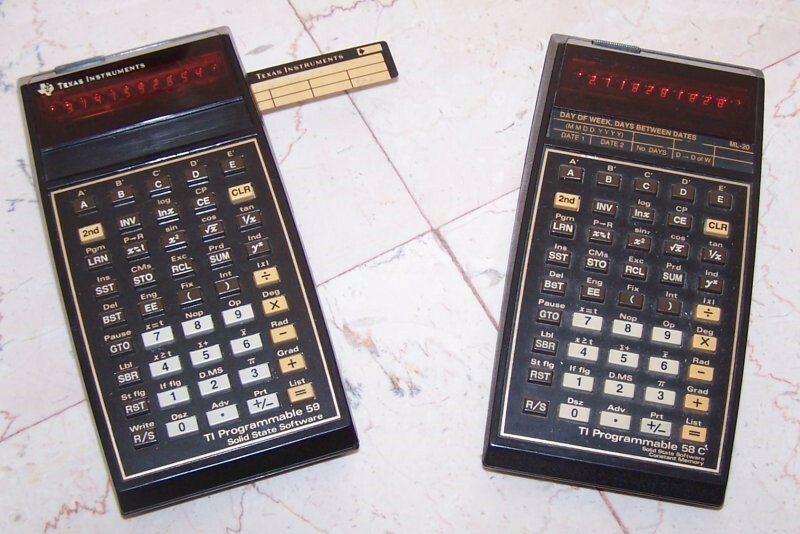 My third programmable calculator, a second hand one I got around 1985. I first had the TI 57 and then the TI 66 before the TI-58C, yet obsolete compared to thenew LCD machines with low cost and low power. No more AC adapter needed. magnetic card reader for the 59. 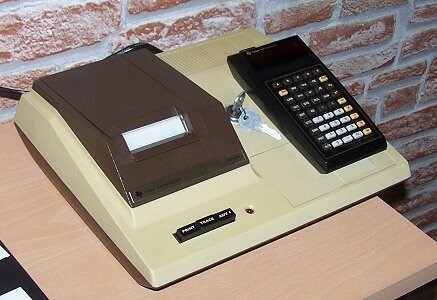 Here is the TI-59 onto its thermal printer: no ink cartridges to change. Last version 1.66, April 4th 2009. 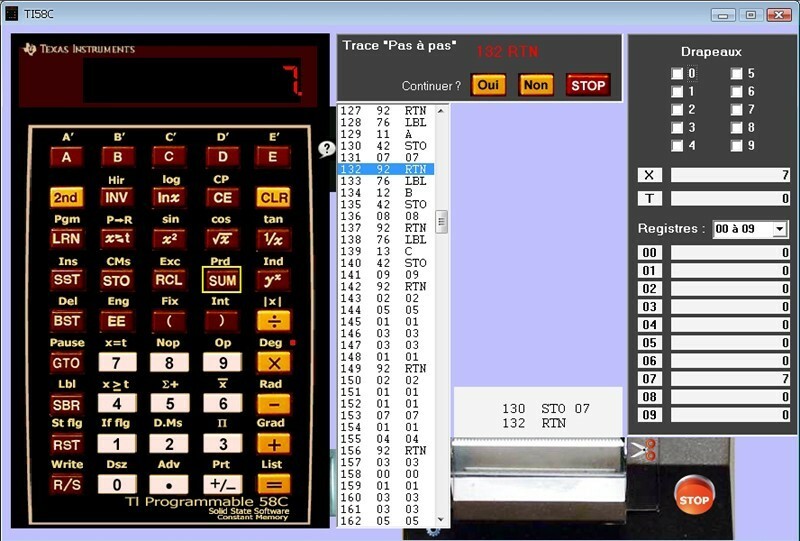 Last update for Shell, April 18th 2009.
the TI59ce emulator running on Pocket PC! The TI Compiler Shell, the graphic interface is available! Included: french and english documentation with automatic installer for Windows. The Shell with the edition window, the listing, the MS-DOS window for the compiler and the Windows TI-59 emulator. 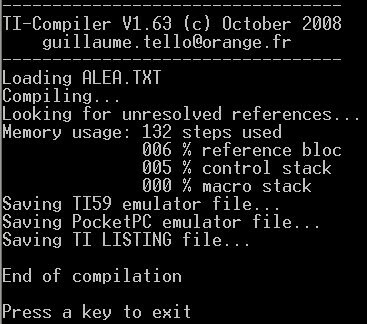 TI Compiler is a DOS program, 100% assembly A86, that just requieres a PC XT under DOS 3.xxwith 128 Kb ram. It provides simple commands to define register and label names, facilities to use the unofficial HIR functions, pseudo-opcodes to replace dark operations (as OP 2x or OP 3x remplaced by INC and DEC) and a lot oferror messages to ease the debugging. ...with variable names and procedures names! ...with label names calculated automatically! ...with structures as IF/ENDIF, or FOR/LOOP clearly defined! ...with text and clear orders! ... but also the file loadable with the TI-59.EXE emulator for a fast test and immediate debugging. 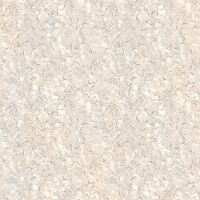 (The default file name is TIEMUL.T59 and can be altered using #EMULATOR command). This bug doesn't exist in TI59ce that I recommend to you as its author is still active. The brand new emulator by Alain Zanchetta for Windows. Based on his work for the PocketPC, here is his PC version. 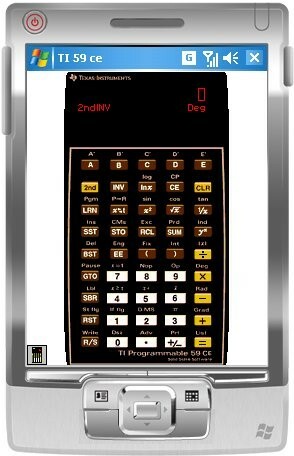 Numbers format has been totally reviewed to match the 13 digits decimal precision of the calculator. 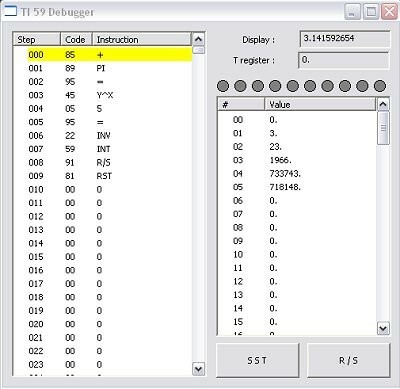 This emulator comes with a debugger with register viewing and breakpoints! Great work than you can download here. Pierre Houbert's emulator for Windows. Brand new, still under development, an emulator full of promises. The author wrote a great documentation, precise and complete, in PDF format (in french). Pierre Houbert's page for downloads is here! Here's an active TI-Shell user! Each ZIP contains the sources and the *.MOD file loadable by the emulator.Victor Toth offers on-line the manuals of the modules here! allows you to test your random number generator, repartition in 10th, mean, standard deviation	Here the result for the generator x'=frac(1/x). Not balanced! First part (from 0,0 to 0,4) are loaded	but the last ones (from 0,5 to 0,9) no. INTEGDBL Maths Calculates double integrals. GAUSS_5 Maths #DATA Calculates integrals with the very efficient Gauss method with 5 points. NEWTON Maths Solves equations f(x)=0. FRACTION Maths RPN calculator for fractions, simplifications, GCD, LCM, approximation of a real number. STATS Maths #PGM, #ARRAY Two variables regression up to Y=a.F(x,t)+b with optimisation of t.
Sunrise, sunset, duration of day, phase of the Moon at any date and from any point on Earth. On the photo, the moon state on Sept 10,2009. Sign "-" so decreasing moon, 60% of light on the right (part 333333) and 40% of shadow on the left	(part 1111). MAXIMUM Maths Search for a local maxium (or minimum) of a function. EARTHDIST Geography Distances on Earth (or another sphere), linear distance, jet lag. Tanks Battle Game strategy VAL Fight against your calculator, destroy the enemy before you get destroyed! LASER Game reflexion #ARRAY, SELECT, #ASK, printing Guess where are the mirrors on your grid using your laser!